I'm thrilled to be joining Neat & Tangled for a fun blog hop, featuring a set designed by my crafting buddy Miriam. The set is called "on the corner of" and I guarantee you've never seen anything like it before. I made it christmas-y already (click!) and now I have a few more ideas for you. 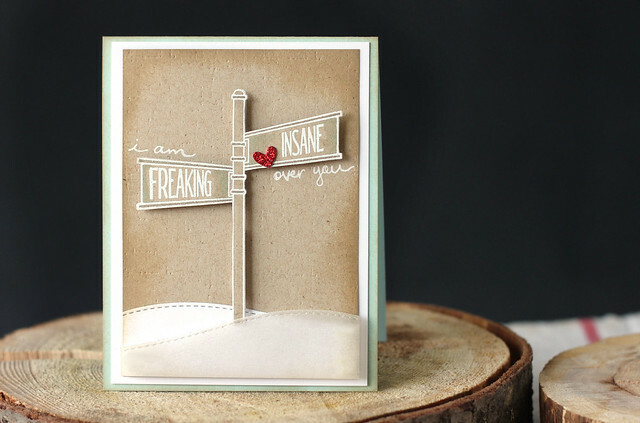 I was thinking, would I ever give a card to someone that read "you are on the corner of freaking & insane"? maybe not (or maybe yes, to the same person that I am freaking insanely in love with, haha) so I added some handwriting to turn it into a more loving card. And then, this card. A street-sign just begs to be leaned on, doesn't it? I made the post longer with some creative inking, so that Jake's large head wasn't actually resting on "fantastic." This card is my big thumbs up (thumbs up? peace sign?) to Miriam. I know she loves rag dolls, and I always aim to please. hee. 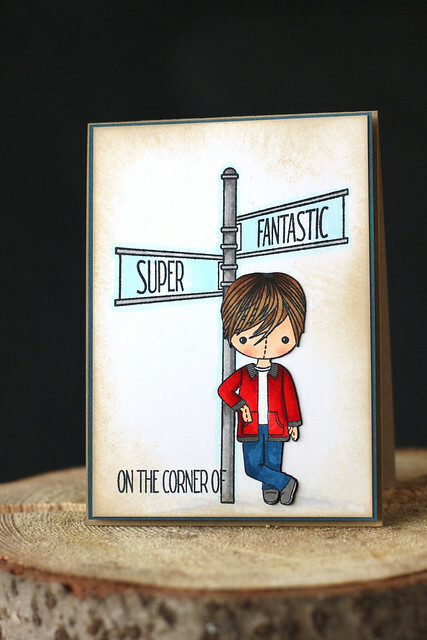 Now that you've seen my cards, hop on over to the other girls' blogs... and leave comments along the way - there will be 2 "on the corner of" winners chosen from among the comments. I can't wait to see what the others have created! Elena, these are such wonderful cards! I love them! Great cards! I wouldn't expect anything less! Cute cards! These stamps are awesome! LOVE that soft snowy scene you created on the first card Elena! The sparkly heart is perfect and I love your handwriting. And I think the sign post helps to blunt the rag doll effect. Ha! Seriously these are fantastic! Thank you so much! this is AMAZING & CRAZY GOOD. I feel like all compliments should be said in that fashion from now on! Love the vellum overlay and the idea of the doll (although I wish it was a cute one) ;) leaning up against the poll. Smart idea, cute, well executed! How cute!!! Totally rockin' the stamps! Wonderful cards...love the way you added to the sentiment to the first. Both of your cards are fabulous! I really love how you added the extra words on the first one. It really makes the card flow! Thanks for sharing! Awesome creations Elena!!! Love it! Love the cards. the little man leaning on the post really adds to the design. Your freaking card is cute - you worked your way around the wording very well. Both cards are fabulous Elena! Wow! I LOVE your first card! It is fabulous! What a cool stamp set! I am excited to see the others' projects, too! Yours is fabulous! Thanks for the chance to win this inventive stamp set! as usual, your cards amaze me!! i LOVE the kraft and white on the first card!! and your added handwriting is brilliant, of course!! it totally ties the whole card together! Fantastic cards and very clever how you added the words to the first one so it isn't so shocking!!! Great cards. I like the words you added on the first one and the leaning figure is perfect on the second. Great card! Love how you added the little boy! Great what you have done on these cards. They are so great for any occasion. Very creative! I'm standing on the corner waiting to win! Love these! Especially how you the first where you added your own handwriting. This sign post & sentiments are totally cool! Your first card put a huge smile on my face! I know several people in my life that I'd love to give a card like this to. And your second card is so darn cute!! Who wouldn't love to receive that?? I want this set!!! They are super cool! I love the first card with your handwriting! Beautiful cards! Love that layer of vellum on the first one, and the second card with the subtle distressing and the boy leaning is so gentle and touching.. I like the snow and the writing to make the card say something a little differently. Your card 2 is so cute with the rag doll...the post does look like it needs to be leaned on. Super job! Love your cards the first with Kraft and white awesome so different. Oh my gosh, your cards are absolutely wonderful. The first one is so, so pretty and romantic, and the second one is just sweet and adorable! these are wonderful! love the inking of the kraft! love both cards and have a great -grandson that I could use the card for. Cute cards - great stamp set. Love both cards, but the second one...well, it makes me giggle...in a good way. wow these are fabulous! I love the first one with the way you did your sentiment... and the second one is too cute! Such cute cards! Esp. love the colors you chose for the first one :) TFS! Terrific cards. I really like how you softened the sentiments--first with a little handwritten message and second with the rag doll image. Awwww......you made the Freaking and Insane into a really sweet card!!! Love the wintertime look. Can't. Look. At. The. Ragdoll. Top Dog Dies: booklets and boxes.